Throughout its history, Milwaukee has gone from manufacturing center for a myriad of products to a “post-industrial” city struggling to adapt to the realities of deindustrialization. Often overlooked in such a narrative is the role that agriculture has played in the development of the city and the broader metropolitan region. For more than 150 years, large- and small-scale farming not only shaped the city’s physical landscape. It also continually informed how entrepreneurs, governmental leaders, and city residents sought to develop Milwaukee’s economy through such tools as private initiative, public education, and government investment, particularly during times of great economic, political, and social upheaval. Yet the importance of the agricultural industry to Milwaukee’s economic well-being has remained pertinent into the early twenty-first century. As the city has been forced to deal with such issues as the demise of the urban industrial economy and the simultaneous rise of the suburb, agriculture has reemerged as a vital component of urban redevelopment, using tools and strategies employed at previous moments during the industry’s history within the city. Milwaukee’s agricultural past, in other words, remains remarkably relevant for the city’s present, and perhaps even future. Milwaukee soon also became a center for the processing of food crops. Flour was the first agricultural product to be processed large-scale in the city. By 1870, local output of flour had reached 1.2 million barrels, and the city trailed only St. Louis as a milling center. Barley and hops grown on southeastern Wisconsin farms went to the city’s brewing industry, to be turned into the product that soon made Milwaukee famous: beer. Yet agricultural endeavors also fueled development within the city limits. 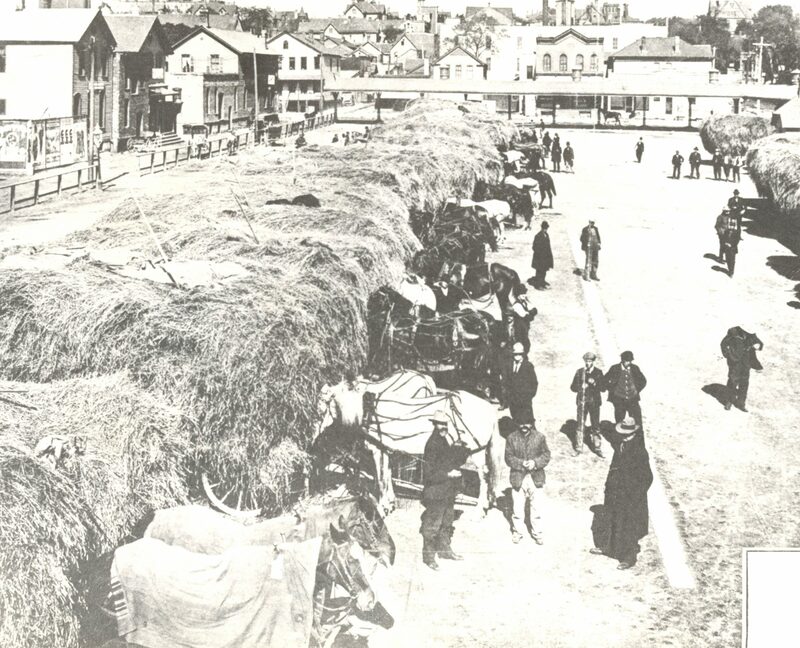 Throughout the nineteenth century, recent immigrants to Milwaukee, particularly those settling on the city’s South Side, brought with them the experiences of farming in the Old World. Not surprisingly, such individuals took to working the soil in their new home as well. In South Side like neighborhoods Tippecanoe, farmers such as Henry Griswold Comstock took advantage of such expertise and the fact that many newcomers to the city desperately needed jobs. In 1891, Comstock began raising celery—and hiring Polish immigrants—on a tract of land bounded by W. Lapham St., W. Burnham St., S. Layton Blvd., and S. 31st St. Comstock’s celery-growing business grew quickly; his crop was worth $50,000 a year by 1900. Quickly, the area surrounding Layton Blvd. came to be dotted with farms growing an assortment of produce. Nearby, the intersection of Howard and Howell Streets found the Burdick, Austin, and Howard families operating substantial farms that supplied fruits, vegetables, and grains to the rest of the city throughout the early decades of the twentieth century. Similar larger-scale farms developed immediately north of the city, in the town of Granville, which consolidated with the City of Milwaukee in 1956. However, as metropolitan growth continued, much of the land that housed these farms was sliced up and sold for alternative uses. In 1956, close to 76 acres of the original 80-acre Leister farm, located in what was previously Granville, was sold to the Milwaukee County Park System. The land became the Dretzka Park Golf Course in 1964. Yet some smaller-scale farms, known as truck farms, were able to take advantage of this changing landscape. Throughout the post-World War II period, for example, one Mrs. Louis Stadler and her husband operated a 20-acre truck farm in the former Granville. Such a location was ideal because the city remained the prime marketplace for the buying and selling of produce through the mid-twentieth century. By 1948, at the city’s main wholesale produce market (Central Municipal Market, located at N. 5th Street and W. Vliet Street), there were 340 stalls in the market, of which 79 had a roof covering. Farmers paid a rental charge of $40 per annum for the roof covered stalls and $25-$30 per annum for the stalls located in the open area. Similar municipal-sponsored markets spread throughout the city—including the Center Street, Mitchell Street, Fond du Lac, and Broadway Markets—and became hubs for the sale of produce, both on the wholesale and individual level. These markets often served as spurs for increased economic development in the neighborhoods that they served. However, the Central Market shuttered its doors in 1967; the Fond du Lac market closed in 1971; and the Center Street market served its last customer in 1980. The demise of these urban markets was caused by major economic shifts in the metropolitan area as well as profound changes in agricultural practices. As a 1973 municipal report on the markets described: “Underlying forces account for this decline in the number of exhibitors. Between 1964 and 1973, metropolitan growth reduced the number of Milwaukee County farms by 75 percent, leaving 45 fruits and vegetable farms operating in 1973.” At the same time, the report found that “Rising farm labor costs have forced some smaller fruit and vegetable farms to discontinue operation while the larger farms tended to shift toward the contract farming of single crops.” The report concluded that many of these shifts were compounded by changes in the retail market where grocery store chains were more frequently buying directly from farmers, thereby bypassing the market system. Such a system rewarded larger farms that produced greater volumes of these valuable crops. From the late 1950s to the early 1990s, the average farm in Wisconsin grew by 70 acres. Such growth could not happen in the Milwaukee metropolitan area where space was already at a premium. The new school called for such things on the cusp of a period of tremendous urban growth in Wisconsin. In 1900, those living in rural locations across the state outnumbered their urban counterparts by a margin of three to two. Yet between 1910 and 1920, the rural population grew by just 4.4 percent, while the urban population increased by 23.9 percent. In Milwaukee itself, the population skyrocketed from 71,440 in 1870, to 285,315 in 1900, and 457,147 in 1920. Perhaps not surprisingly, individuals within the city took to the contemporaneous World War I war garden movement. 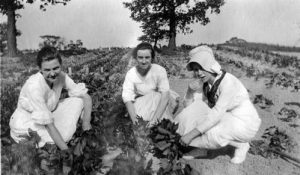 During the summer of 1918, war gardens produced crops valued at $175,626, cultivated on 940 acres, according to figures compiled by the agricultural division of the Milwaukee County Council of Defense. By the late 1920s, as the economy began to falter—in Wisconsin and across the country—the agricultural school faced lower enrollment numbers. In 1928, the school shut its doors for good. But the school had already trained thousands, and Milwaukee County continued to craft agricultural educational outreach programming. Broadly, the County Agricultural Advisory Committee, by 1929, was working across the county to “frame” such programs and to “assist in the development of the projects.” As economic conditions worsened during the Great Depression, the committee also worked to help county growers set up “CoOperative Fruit Markets” through which to sell the produce they grew. By 1932, there were four such cooperative endeavors in Milwaukee County, with nine others in four neighboring counties. As the Depression continued, more and more Milwaukeeans turned to government-sponsored relief garden programs for some sort of assistance. The 1935 growing season featured 4,251 gardens (3,449 backyard gardens; 802 plot gardens) on over 180 acres of land. Funding was now coming from both the state—from the Wisconsin Emergency Relief Administration (WERA)—and the federal governments. The Federal Emergency Relief Administration (FERA) provided funding for guards to watch over the plot gardens. Such agricultural redevelopment of the urban landscape reached its apex during World War II. Under the leadership of University of Wisconsin-Extension employee and chairman of the Milwaukee County Victory Garden Committee Alex Klose, the proportion of Milwaukee-area households growing their own vegetables, in gardens usually 20 feet by 30 feet, quickly rose from 30.2 percent in 1942 to 54.8 percent in 1943. Milwaukee County opened ninety acres of parkland to city dwellers without yards of their own and institutions like the police department set up gardens at places like the precinct station at 47th and Vliet. Under Klose’s direction, a remarkable 123,000 victory gardens were planted in the county annually. The Milwaukee Journal reported that the program was rated by the federal government as first in size of gardens, first in management of these gardens, and third in total number of gardens in a metropolitan area in 1944. By the late twentieth century, the legacy of the World War II-era victory garden would be revisited by those calling for a return to urban agriculture. As farming practices continued to evolve—and as deindustrialization produced wide swaths of vacant lots throughout the city—new generations of urban farmers came to reimagine the cityscape as a place of agricultural production. In 1978, the Shoots ‘n Roots program, co-sponsored by the University of Wisconsin-Extension, the City of Milwaukee, and the United States Department of Agriculture (USDA), reached out to 3,300 participants who helped plant over 1,300 gardens at 29 citywide sites, with a total of 200,000 square feet under cultivation. Such efforts inspired the likes of former professional basketball player Will Allen who, beginning in 1993, turned a series of abandoned greenhouses on the city’s North Side into perhaps the most famous urban farm in the United States: Growing Power. Allen received a MacArthur Foundation “Genius” grant in 2008 for his work and now oversees multiple farms throughout the metropolitan Milwaukee region. Moreover, Growing Power is pushing agriculture in innovative directions within Milwaukee. The farm has emerged as a pioneer in aquaponics, a way to combine the growth of produce and fish without using soil. At Growing Power, state-of-the-art aquaponics systems deliver wastewater from the fish tanks to the plant beds above, which take up the nutrients provided by the fish waste. The plants then cleanse the water before it is returned to the fish. Such a method of growing is particularly useful in urban areas where farmers face both lack of growing spaces and contaminated soil. The drive to find agricultural methods that speak to a changing city is at the heart of another unique Growing Power strategy: the development of a multi-story vertical farm. As of early 2016, Growing Power was raising the money to build such a structure. As more and more of the world is urbanized—and as population growth and climate change become issues all farmers will have to address—traditional farming may not provide enough food to feed the world’s inhabitants. To Allen, vertical farms provide one potential solution to such problems while simultaneously providing the City of Milwaukee with a new tool for urban economic redevelopment. It is also Growing Power’s goal to have this facility house the Cooperative Institute for Urban Agriculture and Nutrition, an organization comprised of Milwaukee area universities (public and private), non-profit organizations, and governmental agencies. This institute, incorporated in 2016, will, like the School of Agriculture and Domestic Economy some one hundred years ago, work to educate urban farmers for the new millennium. Yet urban growing continues in Milwaukee on a smaller scale as well. Since 2000, Milwaukee Urban Gardens (MUG), for example, has worked directly with local government officials to pair city-owned vacant lots with those wishing to start community gardens. That same year, Walnut Way Conservation Corp. began planting a series of gardens and fruit orchards throughout the Lindsay Heights neighborhood. By 2016, hundreds of such sites existed across the city, from All Peoples’ Orchard on the predominantly African-American North Side to a garden at 15th Street and Mitchell Street on the city’s primarily Latino South Side. Hmong farmers have also begun to grow within the metropolitan region, and one can find such individuals and their families selling their produce at such sites as the Fondy Farmers Market. Much like the farmers that preceded them, these diverse residents of the city are realizing that agriculture can play a vital role in the continuing health and vibrancy of a constantly evolving urban landscape. ^ John Gurda, “Eat, Drink, and Be Prosperous: A Short History of the Food and Beverage Industry in the Milwaukee Region—The Seven Counties of Southeastern Wisconsin,” report commissioned by the Milwaukee 7, December 7, 2010, 2,http://c.ymcdn.com/sites/www.fabmilwaukee.com/resource/resmgr/docs/john_gurda_f&b_history_2010.pdf, now available at http://c.ymcdn.com/sites/fabmilwaukee.site-ym.com/resource/resmgr/docs/john_gurda_f&b_history_2010.pdf, last accessed June 12, 2017. ^ Edward S. Kerstein, My South Side (Milwaukee: Milwaukee Journal, 1976), 2. ^ Ron Winkler, Milwaukee’s Town of Lake (Mount Pleasant, SC: Arcadia Publishing, 2013). ^ “Historic Preservation Study Report: Isaac Leister House,” City of Milwaukee Historic Preservation Committee, Summer 1983; “Market Stalls Open for 1940,” Milwaukee Journal, June 16, 1940. ^ Amy Rabideau Silvers, “Last of the Truck Farmers,” Milwaukee Journal Sentinel, August 26, 2010; “Small Truck Farm Milwaukee Area,” Milwaukee Sentinel, August 30, 1953. ^ Marketing and Facilities Research Branch, U.S. Department of Agriculture, in cooperation with the Department of Agricultural Economics, University of Wisconsin, “The Wholesale Produce Market at Milwaukee, Wis.,” January 1950, 7, Legislative Reference Bureau, City Hall, Milwaukee, Wisconsin. ^ “A Report on Milwaukee Municipal Farmers’ Markets,” 1973, 1, 2. Legislative Reference Bureau, City Hall, Milwaukee, Wisconsin. ^ Milwaukee County School of Agriculture and Domestic Economy, “Historical Sketch,” 1915, 16-17, box 9, folder 8, Milwaukee County Historical Society, Milwaukee, Wisconsin (hereafter MCHS). ^ Milwaukee County School of Agriculture and Domestic Economy, Annual Catalog, 1912-1913, 10, box 2, folder 1, MCHS. ^ Milwaukee County School of Agriculture and Domestic Economy, Annual Catalog, 1915-1916, box 2, folder 1, MCHS. ^ Robert C. Nesbit, Wisconsin: A History (Madison: University of Wisconsin Press, 1989), 460. ^ “War Garden Products Worth Big Sum,” Milwaukee Journal, January 7, 1919. ^ “Annual Report of the County Agricultural Agent,” U.S. Department of Agriculture, Office of Extension Work, Washington, DC, 1929, 1, 4, Milwaukee County Institutions and Departments, 1848-ongoing collection, box 10, folder 37, MCHS. ^ “Annual Report of the County Agricultural Agent,” U.S. Department of Agriculture, Office of Extension Work, Washington, DC, 1932, 5, Milwaukee County Institutions and Departments, 1848-ongoing collection, box 10, folder 37, Milwaukee County Historical Society, MCHS. ^ “Annual Report of the County Agricultural Agent,” 1935, 10, Milwaukee County Institutions and Departments, 1848-ongoing collection, box 10, folder 37, MCHS. ^ John Gurda, The Making of Milwaukee (Milwaukee: Milwaukee County Historical Society, 1999), 314. ^ “War Was Seed for Gardens,” Milwaukee Journal, March 23, 1978. ^ Steven D. Brachman, Text of Presentation Given before the Policy Committee, January 30, 1979, Henry Maier Papers, Box 166, Folder 1, University of Wisconsin-Milwaukee Archives, Milwaukee, Wisconsin. ^ Will Allen, with Charles Wilson, The Good Food Revolution: Growing Healthy Food, People, and Communities (New York: Gotham Books, 2012), 194-5. ^ “Vertical Farm,” Growing Power website, last accessed June 12, 2017; “Cooperative Institute for Urban Agriculture and Nutrition,” Global Health Institute, University of Wisconsin-Madison, last accessed June 12, 2017. ^ “Milwaukee Urban Gardens,” Groundwork Milwaukee website, last accessed June 12, 2017. Nesbit, Robert C. Wisconsin: A History. Madison: The University of Wisconsin Press, 1989. Winkler, Ron. Milwaukee’s Town of Lake. Mount Pleasant, SC: Arcadia Publishing, 2013.